WebAppRunner is the Eclipse RCP application I created to run web applications as standalone desktop applications. I had explained earlier how this application could be used by creating a demo FileList application. 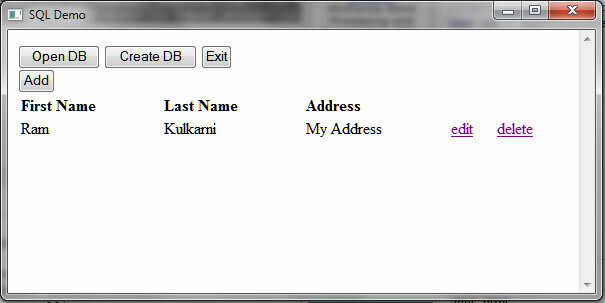 In this post I am going to show how WebAppRunner can be used to create Database applications. I have created a demo application, SQLiteApp. This is a simple application that allows CRUD operations on a simple Employee table. User interface for this application is created using HTML/JS. The database APIs are implemented in empDBManager.jar included in SQLiteApp.zip. To see how this application works, execute it by passing path of this Zip file to WebAppRunner. ‘Open DB’ allows you to open existing SQLite (employee) database. Click ‘Create DB’ to create a new employee database. Click ‘Add’ button to add a new employee record. I have made a few changes to WebAppRunner. I have added three new APIs in WebAppRunner. Objects created/retrieved with Java APIs for WebAppRunner can now be passed as arguments by prefixing $ to the variable name. SQLite JDBC driver is in sqlitejdbc-v056.jar, which is also packaged in the application zip file. Classes in empDBManager use this JDBC driver. Take a look at emp.js (again, in SQLiteApp,zip) to see how Database APIs in empDBManager.jar are called. Note that SQLDemoUtils class is in empDBManager.jar. The above function call creates an instance of EmployeeDBManager (by passing filePath as the argument to the constructor), which can be referenced as empMgr. Notice above how SQLiteApp remembers last opened DB file in properties file using some of the new APIs added to WebAppRunner. I hope this example gives a glimpse of how you can create powerful database standalone applications using HTML/JS UI with Java backend. do i need a JVM to run this application? Yes, you will need a JRE to run this app. JRE is not packaged with it. Hi Ram, is there also a Linux version of WebAppRunner? No, I haven’t created a Linux build yet. I will have to first set up a Linux machine, hence it is getting delayed.